﻿﻿What ﻿kind of back problems can I treat? Back pain is very common and can be caused by a number of factors. Much back pain is mechanical in origin and these are the conditions that my extensive training as an osteopath helps me to resolve. I've summarised some of the main conditions and my likely treatment approach below. If you want to discuss your own details, please call me on the number above. Joints can cause difficulty by either generating pain or restricting movement, making your back sore or stiff. My role is to assess your movement and work to reduce joint restriction where it is appropriate to do so, with the aim of spreading the load and the work as evenly through the joints of the spine as possible, thereby reducing stress and irritation that can lead to increased wear and tear and inflammation of particular joints. It is the inflammation that so often leads to pain and immobility and so my treatment also works to remove obstacles to blood flow in the area and so bring in fresh nutrients to nourish the tissues and allow toxins and excess inflammatory materials to drain away. There are many joints in your back which can become inflamed; each vertebra in your back has four small facet joints that are often problematic and each rib joins on to the spine by one or two joints. 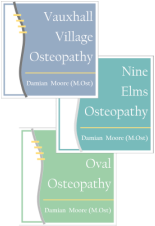 Many problems with these joints respond very well to osteopathic treatment and if there is no underlying cause there can often be an immediate and dramatic reduction in symptoms. Some problems such as degeneration or problems caused by underlying condition may not be resolved but by reducing stress on the area symptoms may be relieved. Pain may be caused by tired muscles, for instance the muscles between the shoulder blades and at the base of the neck may become fatigued if we spend all day at a computer craning forwards. Over time imbalances occur in the strength of muscles in the front and back of the neck and torso, leading to postural changes, upper cross syndrome describes a common pattern for these phenomena. Factors which may increase the likelihood of muscular fatigue or strain include postural asymmetries, such as scoliosis and hypermobility, and my treatment will be tailored to your individual needs. I can work with you to help stretch shortened soft tissues (muscles etc), provide exercises to strengthen weakened muscles and provide advice on how to reduce the strains which lead to poor posture. Postural changes can also lead to joint dysfunction, see below. Sometimes the disc becomes so weak or cracked that some of the gel-like fluid is squeezed and creates a focal bulge, this is a slipped or herniated disc and the bulge can press on a nerve root as it leaves the spinal cord causing pain to radiate, usually in a line from the back and often into the buttocks and down a leg. In some cases this will develop into a ruptured disc or disc prolapse and the gel will enter the spinal canal, this can cause further irritation to the nerves as the gel itself causes an inflammatory reaction. Sometimes the pain in these cases disappears from the back but remains in the legs. The pain in the buttocks and legs from disc injuries is often called sciatica, although this is not technically the correct term as it is irritation to the nerve root not the sciatic nerve. I cannot remove the bulge but can work to ensure that the nerve is not compressed or stretched elsewhere along its course (it is not uncommon for several minor insults to the nerve to add together and cause or increase symptoms), as well as working to ensure that stresses are reduced on that joint and that problems elsewhere do not start to occur as a result of the different way you start to use your body in response to the discomfort you are experiencing. If you have a disc injury, don't panic. Most people over 40 have bulging discs with no symptoms and the body is capable of learning to ignore the signal saying that the nerve is irritated, so that the pain stops; a bit like turning down the sensitivity on a burglar alarm once you realise it's being set off by every insect. In cases of prolapse the body also often reabsorbs the bulge so that it disappears over time. Back pain can be caused by a variety of problems and many of the questions I will ask you about your general health are to establish whether the pain in your back is coming from another organ or to try to exclude any serious (but rare) conditions. I will always refer you if I believe the cause of your problem is something not appropriate for osteopathic treatment.